Google is really an innovator, I could say that Google is an innovator because of their new feature in Google Labs called Google Fast Flip . It is changing the way we can see the fresh and Updated News in the web. 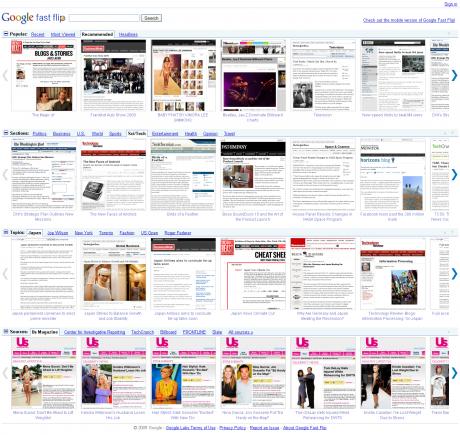 I can say that Google Fast Flip is great tool and Make me feel as if I am reading magazine in the web. In My Humble Opinion I believe that it would be better to use this instead of feed reader . You can check their about page [ About Google Fast Flip ] for further information about this product. Remember when I told you that you can earn from posting current Events , I think the new Google fast Flip can help you a lot. This will definitely help me to feed my other site 🙂 In The Current News ( It is New , In a sense that I am not giving much effort at that blog as of today 🙂 ), Below is the screen capture of the Google Fast Flip and it is really fast to Flip it. I just hope Google will contact me to be included in fast flip too. hehe! The mobile version is good too. Di imposibleng mangyari yan 🙂 sana may user preference ano para pwedeng maglagay ng mga site na gusto natin. The first time ko nalaman to from TechCrunch, sinubukan ko agad then sinearch ko ung DC. Haha! kala ko nung una automatic na pag nasa G news andun nadin. LOL! Sana nga eh may pinoy na site naman andoon 🙂 Darating din yun doon..
@Dexter Panganiban, oo nga po ah! grabe ganun pala un. ang galing ng google. may tanong po ako tungkol sa adsense. makakarecive po ba ako ng mail from google na pwde ko ng kuhanin sa western union ang earnings ko. hinihintay ko pa po ung 1st adsense ko eh..hehehe. thanks po!